The film begins with the backstory of the villain, Sivana and how he gets to be so evil. An accident and a real jerkass of a family may or may not be involved. 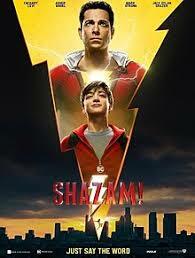 The scene then cuts to Billy Batson (Asher Angel), a street urchin that escaped from yet another foster home and is looking for his mother who he lost as a child. He gets caught, gets sent to a another group home where we meet his new siblings. Things change when Billy goes to school, fights off bullies, and gets transported to a magical realm where he inherits magical powers and name of the wizard Shazam (who you might recognize as Djimon Hounsou, aka Korath from Captain Marvel and the Fisher King from Aquaman.) From there, hi-jinks ensue. After Aquaman, it was safe to say that maybe, just maybe, DC had turned the ship around. But I (and no doubt, many other people) were apprehensive. Wonder Woman, after all was a great film that lifted the spirits of many a DC fan before the massive anchor that was Justice League sent those hopes into the depths again. With Shazam, things seemed different. No longer was Zack Snyder in charge of the overall direction of the DC universe and it showed in the trailers, with a more positive, lighthearted tone. And boy, is it different from the rest of the DCEU films. It takes the tone set by Aquaman and runs with it. This film is humerous. Jokes fly thick and fast, and even if they don’t all land the stark change of pace from BvS and Justice League is amazing to behold. A strong performance by Zachary Levi doesn’t hurt either. Playing the titular superhero when Billy shouts his name, the movie essentially gives him free rein to let out his inner 13 year old self and he gleefully obliges, goofing around and showing off in hilariously juvenile ways. This is perhaps exemplified best when Billy uses his powers to gain access to venues that are best reserved for adults. Or when he turns into his adult form to cut class. Or charge phones. It’s all supremely endearing and delightful in a childish way. The same however can’t be said about the villains. They’re bog standard demons that can turn into smoke. Supposedly, they represent the seven sins, but aren’t in any way distinctive or memorable. Sivana himself is pretty linear and cookie cutter. His brand of evil is rather generic and worn out, and the way he is defeated is… lackluster. It is a change from the usual CGI fight fest, but we also get that, and it’s quite ho-hum as well. That is not to say that the film doesn’t have its serious moments. The main subplot of the movie sees Billy trying to find his lost parents, and the scene where he reunites with his mother is pretty gut wrenching as he realizes the circumstances where he was left behind and the reunion itself were not quite how he imagined. The supporting cast do their part in bringing the movie to life. Billy’s foster siblings round out the film and bring the world of Shazam to life. Ian Chen from Fresh off the Boat gives a hilarious performance as Eugene Choi, a nerdy kid who is obsessed with his video games, Grace Fulton is wonderful as an older Mary Bromfield, and Jack Dylan Grazer is appropriately shifty as Freddy Freeman. Faithe Herman as Darla Dudley, and Jovan Armand as Pedro round out the family. It’s sad the DCEU is no more, as this film and Aquaman could really have turned things around for that universe. But that universe existing might have brought us a very different movie than the one we got. Shazam isn’t the best DC movie. That still goes to the Dark Knight, for me anyway. But this movie had charm and soul, something that DC films have sorely been lacking for a long time. Although this isn’t part of a shared universe anymore, there’s still enough cameos and links to firmly establish a common continuity between all these DC films. Let’s just hop they don’t muck it up the second time round.